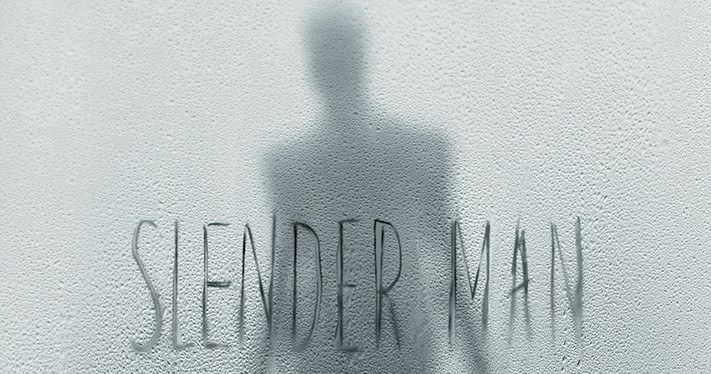 The first official, very creepy poster for the Slender Man movie has been released online. If that isn't enough for you horror fans out there, the trailer is slated to be released tomorrow as well. Slender Man has been practically begging for a big screen adaptation ever since the famed creepypasta creation made its way online in 2009 and now, it's finally happening. We may not have any footage yet, but if this first poster is any indication, this is going to be seriously sinister. This first Slender Man poster is very simple, but gets the point across. We see the shadow of the terrifying internet figure behind a wet window, with some unsettling streak marks going down. The title is written across the center of the poster and that's about it. Even if you aren't familiar with Slender Man, the minimalist approach definitely works. Will they take the same approach with the Slender Man teaser trailer? We shall see. Not much has been revealed about the movie so far, so it's hard to even speculate at this point. Slender Man started out as a creepypasta meme back in 2009 on the Something Awful forum. Eric Knudson, also known by "Victor Surge" is credited with creating the now iconic figure, usually portrayed as a thin, unnaturally tall man with a blank and featureless face, and is typically wearing a black suit. While there has been interest in making a movie about Slender Man previously, tracking down the rights was difficult. Often times, and Slender Man is no different, the creations are crowdsourced and don't come from an individual or small group of individuals. Determining ownership is tricky. Sylvain White, best known for his work on Stomp the Yard, makes the jump to horror as the director of Slender Man, which arrives in theaters on May 18. The cast for the movie includes Jaz Sinclair, Joey King, Julia Goldani Telles, Annalise Basso, Alex Fitzalan, and Kevin Chapman. If you're familiar with the Marble Hornets YouTube series about Slender Man, which was done in found footage, it will be interesting to see if this movie takes any inspiration from that approach, which many found to be very effective. Will this be found footage? Will it be more traditional? We'll know a lot more soon enough. HBO released a documentary, Beware the Slenderman, last year, as the character was connected to a pair of 12-year-old girls who tried to murder their friend and said they were encouraged to do so by Slender Man. This movie isn't likely to touch on that subject in any way, but it will be interesting to see if they bring any of the real-world stuff into it. While we wait for the trailer to drop tomorrow, be sure to check out the new Slender Man movie poster, courtesy of IGN, for yourself below.